I realised that in some of my previous posts I didn't really detail connecting to ATP and ADW. Here's a slight more in depth walkthough. The Oracle_CX Python driver Module. The next step is pretty straight forward. 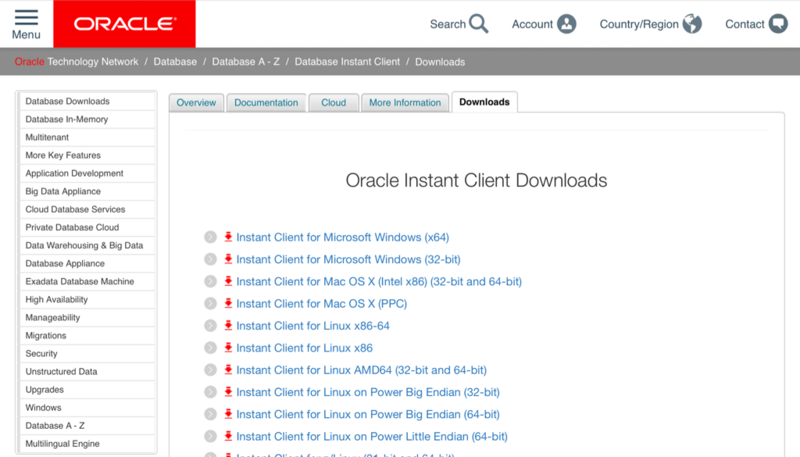 You can download the oracle instant client from here. There's plenty of guides out there that show you how to install python on your windows or mac. If you haven't done this already This guide is a good place to start. I'm assuming that you've also gone through the steps of installing pip. If not you can follow this simple guide. I'd also advice you create a virtual environment with virtualenv before you doing anything else. It's considered best practice and isolates you from current or future library conficts. And thats all we need to do at this stage inside to setup our Python environment. The final thing we need is the wallet containing the credential and connect string details to enable us to connect to ATP or ADW. You'll need to log onto Oracle OCI console to do this unless have been provided the wallet by a colleague. Simply navigate to your ATP or ADW instance and follow the instructions below. While it's not necessary we'll download and unzip the wallet into the virtual directory we've created (adb_virt_env). We should also take a look at tnsnames.ora to see which services we'll be using. You can do this by taking a look in the tnsnames.ora file. There's likely to by lots of entries if you have lots of ATB or ADW instances in you OCI compartment. In my instance I'll be using a connect string called sbatp_medium which has a medium priority but pick the one appropriate to your environment. We'll only need to remember its name for the next step. We need to set the environment variable TNS_ADMIN to point at our directory (adb_virt_env) where all of the files from our wallet are located. And now we can simply connect to ATP or ADW instance using a standard Python database connect operation using the connect string we remebered from the tnsnames.ora file. NOTE : I'm assuming you've created a user in the database or you're using the admin user created for this instance. And thats it... From here on in we can use the connection as it was a local database.